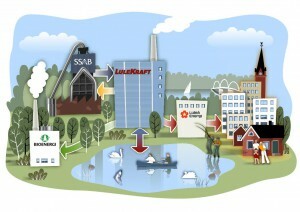 The DHC system in Luleå supplies 31 000 households with heating and cooling on a daily basis. The heat is manly produced at the CHP plant at LuleKraft AB close to the city center. Lukab supplies the base heat production of 185 MW to the grid and gets the fuel from the neighboring steel plant, SSAB, in the form of BOFG, BFG and COG. During cold days and when needed there are peak load production units out in the grid at strategic places that can supply extra heat. These units are mainly using wood pellets, electricity and oil as fuel. Especially the use of oil is an expensive and non-environmentally friendly energy source and is to be used only when demand requires. The total potential heat from these units is 350 MW, which is enough to support the whole grid if the base production at LuleKraft AB should fail. During 2014-2018 Luleå Energy AB invests 45 million Euros in the DHC system due to the expansion of the city. This makes Luleå a great place to be integrated in the OPTi project when new solutions in the grid can be performed, evaluated, optimized and give important input to OPTi-Sim. To gain the most satisfying result four well planned pilots will be performed by Luleå Energy AB. In the project a number of buildings will be test buildings where measurements on vital parameters will be performed during tests. Measurements of vital parameters will also be performed on grid level to cover a greater area. The result will be used to evaluate and optimize OPTi-Sim and see how well the KPI:s are fulfilled. The pilots that will be performed in Luleå are summarized below.